Applications often need to store and use files such as images, videos, and PDFs. Nowadays, there are a lot of choices for cloud storage providers, each of which provides a different API. Meanwhile, web and mobile platforms provide different ways to upload and download files. The variety of storage providers and client APIs create complexity when developing applications that need to handle files. The LoopBack storage service simplifies dealing with files by providing a unified REST API to enable web and mobile applications to upload, download, and manage binary contents using the most popular storage providers: Amazon, Rackspace, Openstack, and Azure, as well as the local file system. Container provides a simple way to group objects. Think about container as a directory, a folder, or a bucket. Container defines the namespace for objects and is uniquely identified by its name, typically within a user account. File stores the data content of an object, such as a document or image. A file is always placed in one (and only one) container. Within a container, each file has a unique name. Files in different containers can have the same name. Note that a container cannot have child containers. 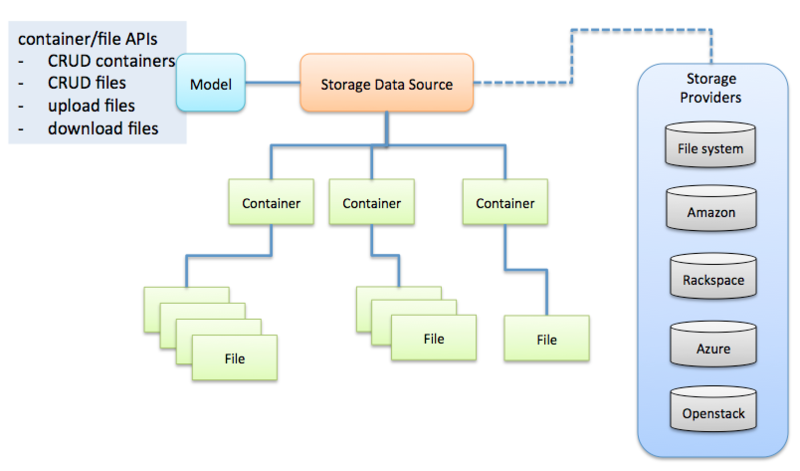 The two-level hierarchy is chosen for simplicity and is the common pattern supported by most cloud storage providers. Please note the root folder needs to exist. Create it first. POST /api/containers/:container/upload Upload one or more files into the specified container. The request body must use multipart/form-data which the file input type for HTML uses. Now open your browser and point to http://localhost:3000. The client side code was derived from this example.